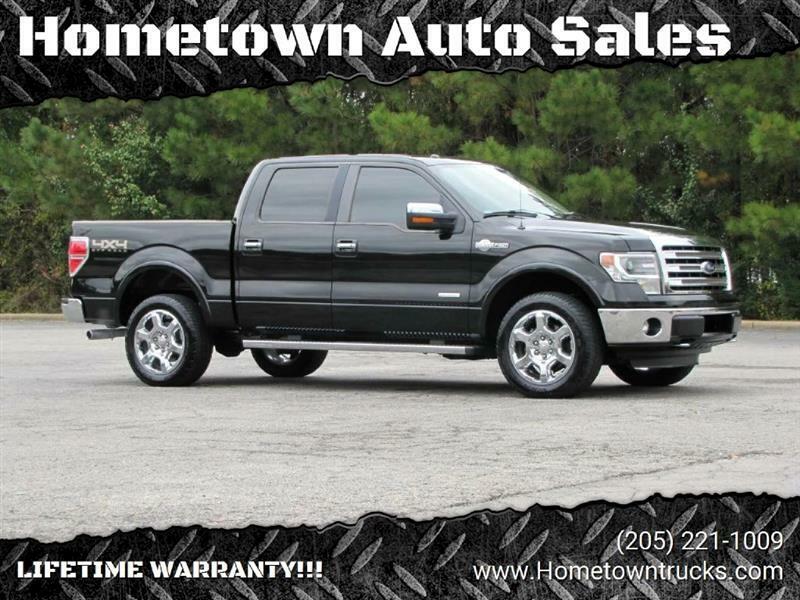 LIFETIME WARRANTY ON THIS 2013 FORD F150 SUPERCREW KING RANCH 4X4!! PLEASE READ: THIS EXTREMELY CLEAN 2013 FORD F150 SUPERCREW KING RANCH 4X4 COMES WITH A LIFETIME ENGINE TRANSMISSION AND FULL POWERTRAIN WARRANTY AT ZERO COST TO YOU!! THAT INCLUDES THE 4 WHEEL DRIVE!! Take a close look at this clean 2013 Ford F150 Supercrew 4x4 King Ranch that just arrived here at Hometown. It's just been completely serviced here at the dealer from front to back so you're 100% road ready. This F150 comes equipped with all power on the inside, tilt, cruise, keyless remote, Microsoft Sync, tow package, heated & cooled leather seating, navigation, and so much more. Powered by the best in class EcoBoost engine so you can expect plenty of power class leading mpg. This truck drives and handles perfect on the road and its off road capable too. Make the short drive to Hometown and see why we were just voted Best dealer to buy a pre-owned vehicle from in Central Alabama. We offer bank and credit union financing here at the dealership with ZERO DOWN and LOW credit union rates, so you can drive this F150 home today. Also, for that added peace of mind that comes standard here at Hometown remember this: THIS NICE 2013 FORD F150 SUPERCREW 4X4 COMES WITH A LIFETIME ENGINE AND TRANSMISSION WARRANTY AT ZERO COST TO YOU!! NOT A 30 60 OR 90 DAY WARRANTY...... A LIFETIME!! Call JJ at 205 471 2112 or Roger at 205 522 8345. You can reach the office at 205 221 1009. Thanks! !